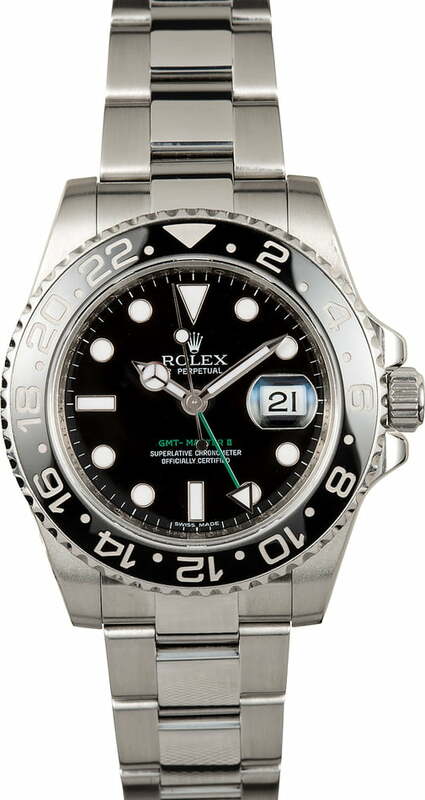 The newest stainless steel Rolex GMT Master II 116710 is characterized by several notable upgrades, including a broader case, new-style Oyster bracelet, maxi dial, and ceramic Cerachrom bezel. The case, despite measuring a traditional 40mm in diameter actually wears slightly larger, thanks to the addition of a larger crown guard and broader lugs. When paired with the bracelet, which now offers a heavier weight, the newer model GMT Master II feels and looks more impressive on the wrist than previous references. 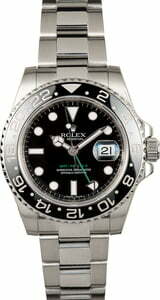 The Cerachrom bezel was a highly anticipated addition to the Rolex catalog and is highly coveted for its rich, even hue, anti-corrosive properties, and scratch-resistance. 24-hour units can be read against the dedicated hand on the dial, allowing the wearer to read local and home time simultaneously. Initially developed as a pilot's watch, the GMT Master II is now highly sought-after by preowned Rolex collectors of all walks of life.